Scottish husband and wife team Chris and Julie Ramsey, aka Plug In Adventures, crossed the Mongol Rally finish line in Ulan-Ude on Saturday to become the first entrants to complete the epic trans-continental challenge in an all-electric vehicle – a modified 2016 Nissan LEAF dubbed the AT-EV (All-Terrain Electric Vehicle). 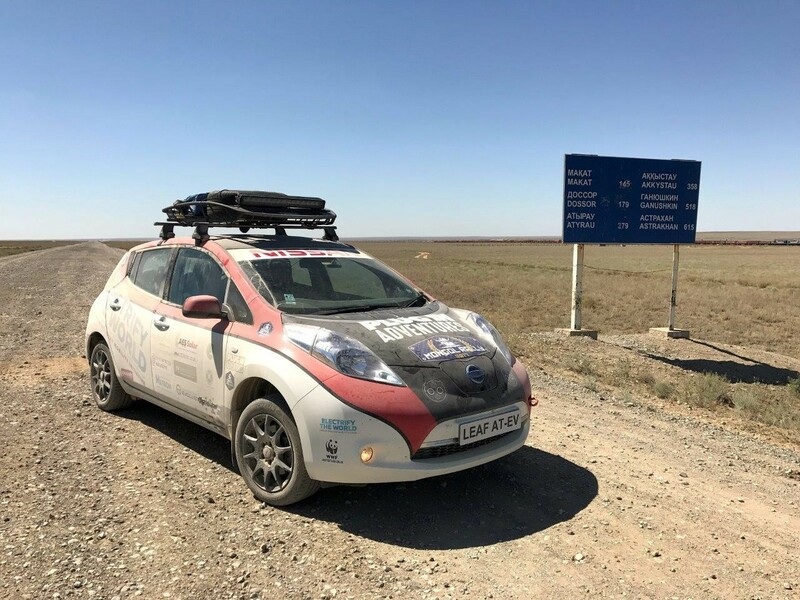 Chris and Julie left the rally start line at Goodwood Motor Circuit in the UK on July 16 and travelled 8,000 miles through 13 countries, charging their car 111 times for less than £100 in electricity costs to reach the Siberian finish line, just north of the border with Mongolia. 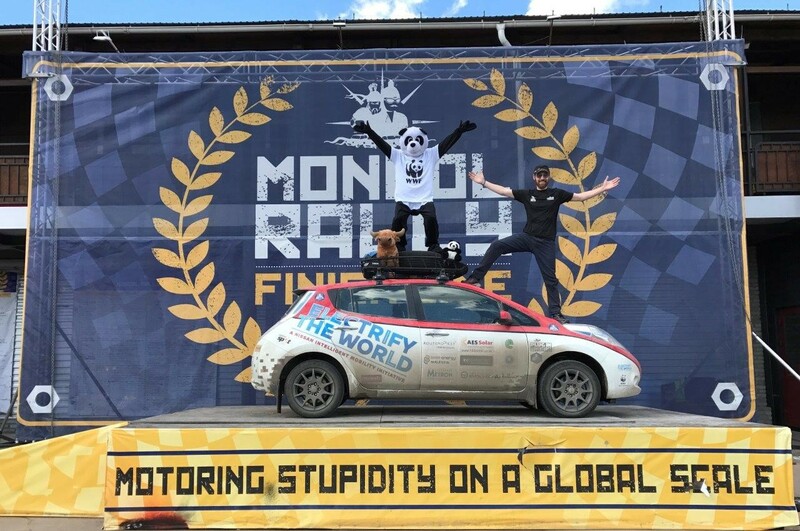 Their Nissan LEAF will now join other Mongol Rally entrants' vehicles on a cargo train back across the continent to Estonia, where Chris and Julie will continue the drive back to their hometown of Aberdeen. In total the pair will clock up more than 10,500 miles during the trip. "There were a number of detractors who told me an electric car isn't capable of long-distance journeys," said Chris Ramsey. "After thousands of miles and almost zero problems, I can tell you that is not the case. This has been the absolute trip of a lifetime, and I can't believe we're now at the finishing line. We've travelled through countless countries using just battery power and zero emissions. I'm elated, ecstatic, a bit exhausted, but also completely electrified!" Throughout Europe, Chris and Julie had the use of an extensive rapid charger network that can provide an 80% battery charge in just 30 minutes. However, once they got into Bulgaria and beyond, they faced a dwindling number of rapid charge options and instead turned to a variety of alternatives for electric power. These included bars, cafes, hotels, hostels, a barbershop, a post office, garages, car dealerships, a tractor showroom, a police station, and three fire stations in Russia. They even had a trained electrician plug their LEAF directly into an electricity pylon in the middle of the woods in Siberia. Chris and Julie enjoyed the goodwill of people in every country they travelled through, only paying for electricity at a handful of charges. Rarely did anyone turn down the team's request to plug in their car, and on top of that they were frequently offered drinks, food and even accommodation for the night. "We've been shown some of the best hospitality we could have hoped for," said Chris Ramsey. "It's certainly changed our perspective of how we should behave when we get home. One example that sticks out was when we turned up at a Nissan dealer in Russia at 2 am. There was a chap waiting for us and he plugged our car in securely in the workshop, then led us into the showroom where he gave us tea, food and comfy sofas to sleep on." The Nissan LEAF also proved a trusty companion. Chris said: "In terms of vehicle reliability, the car's been brilliant. We've had one puncture, one damaged alloy wheel, a mud flap came off and someone stole one of our stickers. That's it!" On the challenges that faced the pair, Chris said: "There were of course a couple of low points. Illness hit us in the later stages of the journey which was hard, but other than that, it's been fine. Some of the longer charge times at petrol stations in the middle of nowhere left us feeling a bit low, but then when you pull into a small town or village and you're greeted warmly by the locals – it just lifts you up and it's such a thrill." During the journey, the Plug In Adventures team was keen to promote the benefits of running an all-electric vehicle, and they found interest in the car and their journey in all the countries they visited. Chris was even invited to take part in a series of panel discussions at the Astana International Exposition, bringing the 2017 theme, "Future Energy," to life. The LEAF AT-EV was also put on display at the expo. 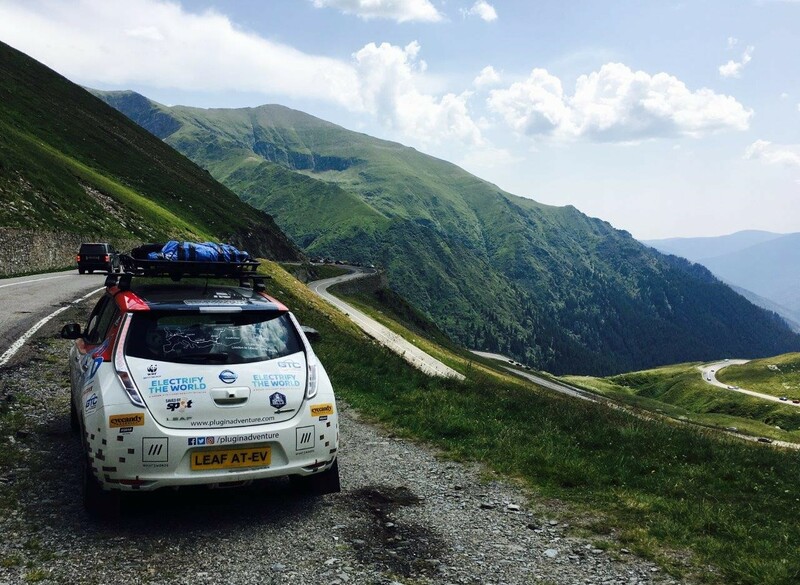 The team also tackled some of Europe and Asia's amazing roads, including the Transfăgărășan Highway in Romania – a winding mountain pass that provided a healthy amount of regenerative braking in the car's B-mode. The longest stretch the couple did on a single charge with their fully loaded vehicle was 115 miles, pulling in to charge with 6% capacity left. On average Chris and Julie were logging 95 miles between charges, keeping enough spare battery power once they got to the charging locations in case they needed to find an alternate energy source. Julie Ramsey said: "This has been a trip of a lifetime. We've eaten unusual foods, slept in weird locations and even travelled on a cargo ship. We've met the most amazing people and been overwhelmed by both the generosity and the interest in our electric adventure. I'd say this trip probably isn't for everyone. It's certainly been challenging at times. However, the experiences we've had and the people we've met along the way have been priceless. I think we'd do it all over again in an instant!" The Plug In Adventures' car is a standard 2016 30kWh Nissan LEAF Acenta, which offers a range of up to 155 miles / 250 km on a single charge**. Key modifications were made to better equip the car once it reached the more remote parts of the journey. The LEAF AT-EV was fitted with Speedline SL2 Marmora wheels for better performance on unsealed roads. Welded plates to the underside of the wishbones, braided brake lines, mudflaps and a 6mm aluminium sump guard added further protection from rough terrain. A modified roof rack provided external storage and was fitted with a Lazer Triple-R 16 LED light bar to produce 16,400 lumens of supplementary low-voltage forward lighting during the remotest parts of the trip. As the Mongol Rally isn't a timed race, the entrants' vehicles ideally provide long distance comfort. The interior modifications to the LEAF AT-EV focused on reducing weight and providing more storage space. The driver and front passenger area was unmodified apart from the addition of rubber floor mats. The rear row of seats and rear seatbelts were completely removed, contributing to a 32kg weight loss. A Fire Extinguisher and Medi Kit were integrated into the boot space. 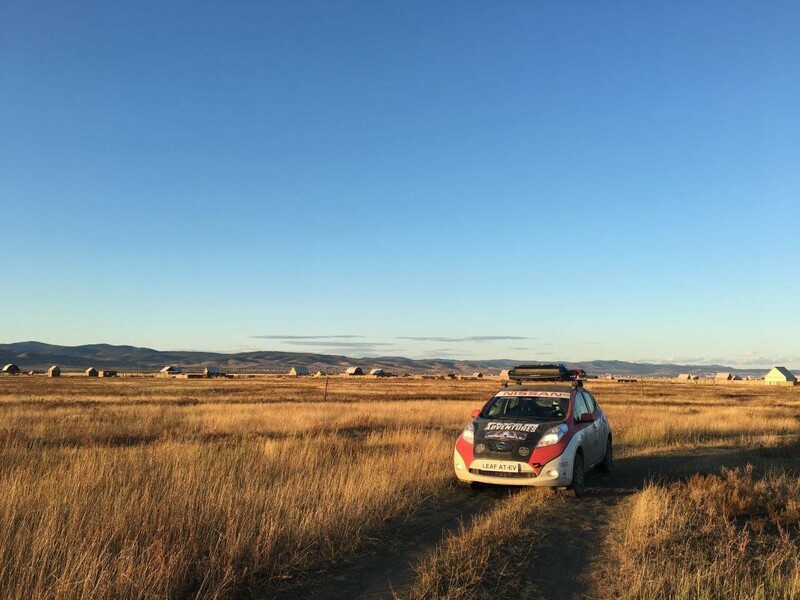 The Mongol Rally is a 10,000-mile charity drive across the mountains, desert and steppe of Europe and Asia which takes place each summer and first started in 2004. The event is organized by The Adventurists (https://www.theadventurists.com) which run a number of events that have raised £5million for charity to date. Each team in the Mongol Rally is expected to raise a minimum of £1000 for charity. The rules state that participants must drive a small, sub-1.0-litre engine car as it will make the event more of a challenge with a greater chance of a breakdown meaning drivers can interact with locals along the way. The drive is unsupported with no ‘on the road backup.' Participants are expected to get themselves out of trouble. * Plug in Adventures (and not Nissan Motor (GB)) independently entered and participated in this event. ** NEDC (New European Driving Cycle) value.